Dive Season in Gorontalo runs from November to April. During this time, seas are typically calm and blue. Light afternoon showers make for enjoyable, balmy nights. Before Miguel’s Diving opened diving in Gorontalo in 2003, no one knew the dive season here. In fact, no others were diving in Gorontalo prior to that. 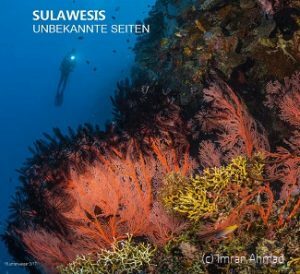 The common assumption was that the dive season in Gorontalo would be the same as its nearest neighbors, Bunaken National Park in Manado and the Togean Islands. The distance to Manado is about 400 km. 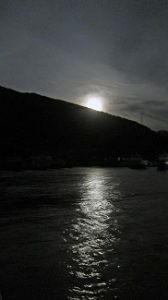 The ferry trip to the nearby Togeans lasts one night. 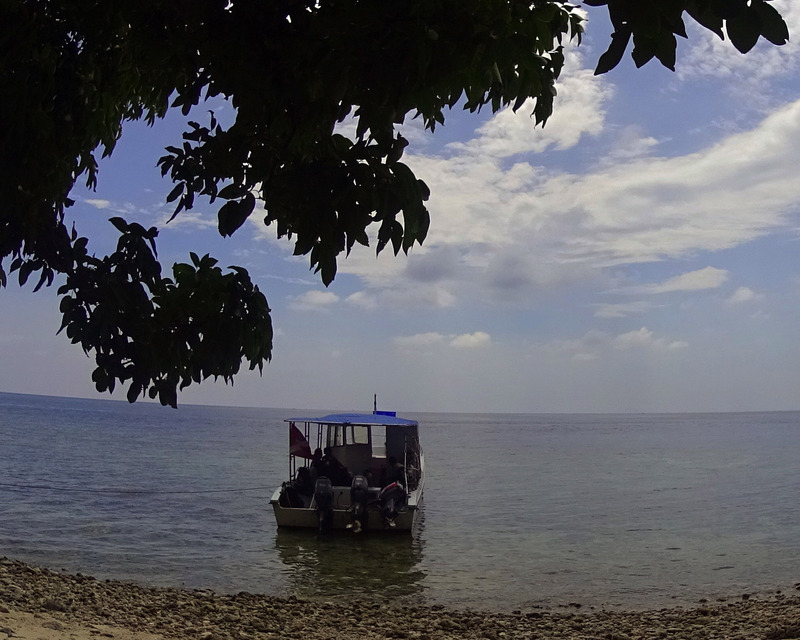 Contrary to conventional wisdom, diving season in Gorontalo is quite different. Its discovery marked the conclusion of two years’ survey work conducted by Miguel’s Diving staff. Conventional wisdom also says that off season for diving should be during rainy season. And, that dive season should be during dry season. In Gorontalo’s case, the opposite is true. The key factor is wind direction not precipitation. When the northwest monsoons descend on Southeast Asia, Sulawesi Island is affected. The winds that bring rain hit two lines of mountains before they reach the sites where Miguel’s Diving takes guests. As a result, the seas along Gorontalo’s southern shoreline are calm. Rain rarely hits the entire area. The usual time for showers is three o’clock in the afternoon when rising temperatures gather moisture. Gorontalo City on average receives half the annual rainfall as Manado, which faces north and into the rains. However, when the dry winds from Australia hit Sulawesi, Gorontalo’s southern coastline is exposed. 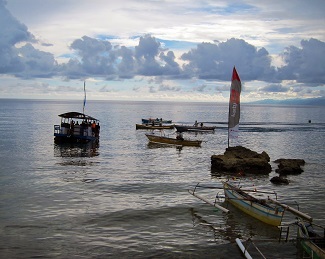 Seas adjacent to Miguel’s Diving dive sites plunge to over four kilometers. With no islands or barrier reefs, the coast is hit by wind-driven waves. Three to five meter waves are typical during dry season. Officially, dive season here runs from November to April. Miguel’s Diving opens for regular diving after the moon change in October. Regular diving ends by mid-May. After that, diving twice in the early morning can be possible. Oftentimes, seas are too rough to use speed boats. The worst sea conditions occur in August. At that time, perhaps only one dive is possible. Sites are limited to only one or two locations by beach entry. Gorontalo’s dive sites are located in Tomini Bay. This large bay is split by the equator. Perhaps because of the closeness to the equator, Miguel’s Diving staff have observed the change in wind direction has not varied more than two weeks during the two decades of observation. As a result, we recommend making a booking with us during regular diving season. Indonesian airlines approved by the European Union now include all those flying to Gorontalo. In fact, all Indonesia’s airlines now have EU approval. This is great news for travelers whom must take internal flights to reach their desired destination. Late last year, the International Civil Aviation Organisation evaluated Indonesian airlines. As a result it upgraded Indonesia’s safety ranking from 151 to 55. Following that evaluation, EU officials made an assessment visit to Indonesia in early 2018. As a result, the EU granted flying approval to all Indonesian airlines. “I am particularly glad that after years of work, we are today able to clear all air carriers from Indonesia. It shows that hard work and close cooperation pay off,” said Violeta Bulc, EU’s Commissioner for Transport. In turn, Indonesia’s Minister of Transport Budi Karya Sumadi welcomed EU’s assessment. “I must thank all stakeholders for having followed the `rule of the game` to meet the international safety standards. It is a (matter of) pride in itself and makes it possible for them to market their products to attract more attention and boost their sales,” said Mr. Sumadi. Travelers can verify for themselves that no Indonesian airlines appear on European Union website list of banned airlines. Now, all of Indonesia’s airlines are approved by the European Union. Should you need flight information when coming to Gorontalo for your dive trip, please contact with us. Hari Ketupat is an annual festival held throughout Gorontalo. It falls on the seventh day after Idhul Fitri, the religious holiday that marks the end of Ramadhan. Although the government usually does not recognize this festival, Gorontalo people celebrate it anyway. Few local people show up to work on Hari Ketupat! Ketupat is a cube of rice that lies within a casing. Someone will hand weave a casing from young palm leaves. Once stuffed with grains of white rice, she will boil the woven casing in water. The rice inside cooks and compresses, creating a cube. Then she cuts open the casing and dices the rice cube inside. It is now ready for eating. In 2018 the Gorontalo provincial government decided to create extra interest in the Hari Ketupat Festival. The governor launched a drive to make an incredible number of ketupat. Officials from Indonesia’s Record Society (MURI) attended the festival to verify the number. Gorontalo people made a record-breaking 34,000 ketupat. Kampung Jawa in Gorontalo Regency is the traditional center of the Hari Ketupat Festival. So, the record breaking initiative took place there. Coastal communities in Gorontalo avidly enjoy their own versions of the festival. This included villages where staff of Miguel’s Diving live. Olele Village, where a marine park is located, hosted a big event in 2018. Although villagers there did not participate in the record breaking ketupat contest,they did create their own merriment. Fun activities included the traditional sack race. Contestants step inside an empty, fifty kilo rice sack. Then they hop down a designated track to the cheers and laughter of their friends. Another silly challenge is to pull out coins stuck in cuts on a coconut using only the teeth. The coconut is hung on a string. To complicate matters, the other end of the string is tied around the leg of the contestant. This forces him or her to raise one leg in order for the coconut to descend level with the face. More serious contestants vie for big prizes. The signature event in coastal villages is the outrigger canoe race. Since several villages gathered at Olele for this year’s race, participants and spectators crowded the beach. The organizing committee placed a series of buoys in locations around the small Olele Bay. Boat captains must pass each buoy without hitting it and return to the starting point to finish. Only three boats at a time can run the circuit, so there are many preliminaries. The final winner received two new boat engines. Guests of Miguel’s Diving typically dive the Olele Village Marine Park. For help with your dive trip to Gorontalo, please make a booking with us. 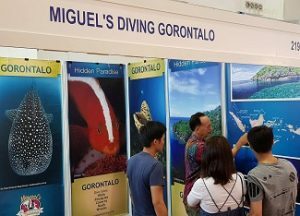 MIDE 2018, the Malaysia International Dive Expo, welcomed back Miguel’s Diving. It has been four years since our staff have participated. The 13th Malaysia International Dive Expo took place 4 – 6 May 2018. It is also called MIDE 2018. Malaysia’s famous Putra World Trade Centre or PWTC provided the venue. The Exhibition opened daily to the public at 10 a.m. It closed nightly at 7 p.m. This year featured 133 companies and around 2,000 visitors. For more information, please visit the official MIDE 2018 website. The expo used Hall One of the PWTC complex. A large international book show used several other halls. MIDE 2018 marks the fourth appearance of Miguel’s Diving at this dive expo. Our booth was 219 and located at a strategic corner. The fascia board name was Miguel’s Diving Gorontalo. Our booth had a dramatic “Gorontalo: Hidden Paradise” layout. Our professional backdrops were designed by Ms. Galuh Riyadi of Jakarta. They featured underwater photo art by divers of Miguel’s Diving. These photographers come from Malaysia, Indonesia and Singapore. One panel featured photographs of Malaysian divers who have been diving with us recently. What great fun is was to look for friends in those photographs! Better yet was to make a selfie with your own photo in the background. Miguel’s Diving staff had a great time catching up with old friends and making many new ones. Gorontalo is an excellent destination for Malaysian divers. Pristine dive destinations are often difficult to reach. Not so Gorontalo! Air Asia offers flights from KUL to Makassar (UPG) four times weekly. 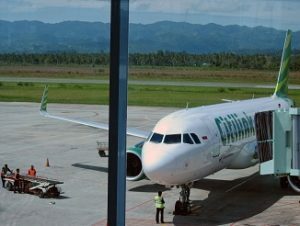 The connecting flight to Gorontalo lasts about one hour ten minutes. 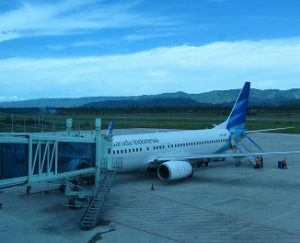 Daily flights via Jakarta are also easy for Malaysian divers to travel to Gorontalo in or out in one day. Gorontalo diving season is the opposite of most peninsular Malaysian destinations. Our season runs mid October to mid May. Officially it is November to April. No reason to cry during monsoon-lah. Come dive in Gorontalo! For many Malaysians food can be an issue. Food in Gorontalo is halal. Even if you did not see us at MIDE 2018, you can still href=”http://miguelsdiving.com/contact-us/” target=”_blank”> book your dive trip with us. Lunar eclipse of a super blue moon was an event not to be missed by anyone in Indonesia on 31 January 2018. Usually, the moon is 384,400 kilometers from the Earth. However, its orbit is not uniform. Sometimes the moon can be merely 358,993 kilometers away. That means it is more than 25,000 kilometers closer. At that time, the moon appears up to 14 percent larger. Additionally, it can appear 30 percent brighter to the naked eye. This rare occurrence is a super moon. On 31 January 2018, the super moon coincided with the blue moon. Moreover, on the same date, the blue super moon also turned red. This happened when it became a blood moon as it eclipsed. A lunar eclipse happens when a full moon travels into the shadow of the Earth relative to the sun. During a lunar eclipse, the moon turns red. Hence the name blood moon. The red is actually the projection of all the sunrises and sunsets onto the surface of the moon. In Gorontalo, the super moon appeared over the mountains at 1855 hours local time (WITA). Miguel’s Diving enjoyed night diving under the full moon. After the divers surfaced, the lunar eclipse began. The first photo sequence shows the view of the night sky at 2032 and 2047 hours. The total eclipse lasted for over an hour. 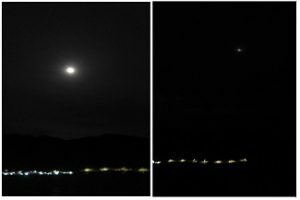 The second photo sequence shows the blood moon at 2212 hours. When the moon is in eclipse, it is indeed red! At 2232 the moon began to emerge from the shadow. By 2333 hours the super moon had returned. The last time there occurred an eclipse of a super blue moon was 152 years ago. Don’t wait until the next super blue lunar eclipse to dive in Gorontalo. We encourage you to book your dive trip with us before then! PADI divemaster staff in Gorontalo can only be found at Miguel’s Diving. 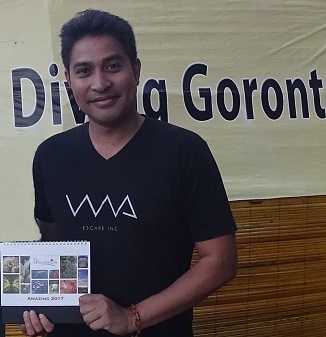 Miguel’s Diving is not only Gorontalo’s pioneer dive center. We are also the only dive operator in the area to have PADI divemaster staff. Actually, five of our full time staff are PADI divemasters. Our only international staff member has been a PADI divemaster for almost 20 years now. Our Gorontalo staff all recently completed their PADI training. As a result, guests of Miguel’s Diving feel safe with our trained, skilled and certified staff. Becoming a PADI divemaster requires successful course completion. Water skills are an important component of the course. Naturally, our four candidates loved this part of the course. They are all long time dive guides. Classroom sessions require different skills. Included in this part of the course are important topics. These include supervising diving activities, assisting student divers and diver safety. A PADI divesmaster candidate will also study risk management and environmental awareness. Moreover, participants must pass both water skills and theory components of the course. Our dive staff received an invitation from Mr. Frans Rattu to complete their PADI divemaster training. PADI Asia Pacific and Politeknik Negri Manado teamed up to offer a special opportunity. Only long time dive guides in the area received an invitation. Also, they must already be certified Rescue Divers. Additionally, candidates must have Emergency Response training or update within two years. 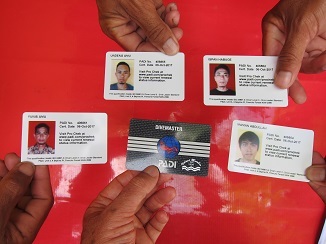 All of our staff already had these PADI certifications. They enjoyed the two weeks in Manado and the study time with friends in the dive industry there. Fortunately, one of their wives came along and helped keep everyone fed. During the required reef cleanup exercise, they found a sun hat accidentally discarded by a visitor. It had a decorative band around it. On the band was some writing in Chinese that said “blue ocean, beautiful day.” So, they decided it would be a great souvenir to bring back to Gorontalo for Miguel’s senior PADI divemaster. All it needed was a quick wash in fresh water! To make arrangements to dive with our certified PADI divemaster staff, please book your dive trip with us.